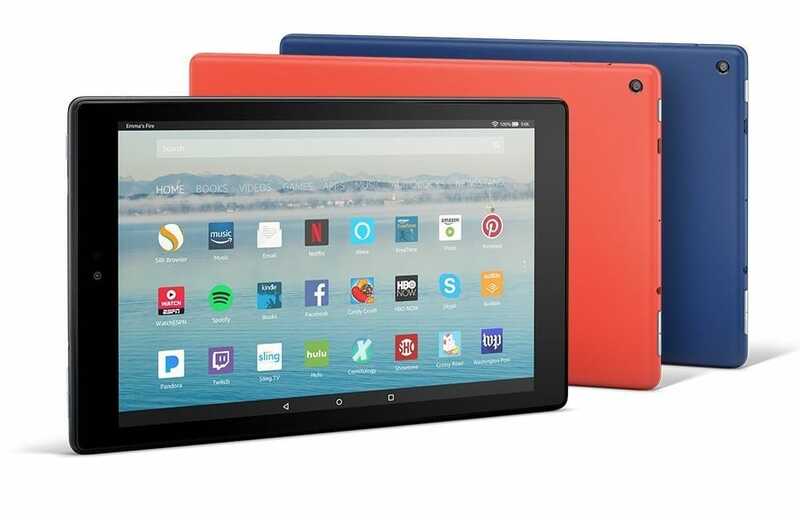 Amazon has just announced the Fire HD 10 and it is available for pre-order and the entry level model costs $149. This new device has Alexa built into it and you can automatically wake the tablet out of standby mode by just yelling out her name. The Fire HD 10 features a 10.1 capacitive touchscreen IPS display with a resolution of 1920×1080 and 224 PPI. Underneath the hood is a MediaTek Quad-Core: 2 @ 1.8 GHz + 2 @ 1.4 GHz , with 2GB of RAM. There are two different variants for storage; 32GB and 64GB. There is a SD card that is capable of supporting up to 256GB of additional storage. You can listen to music, watch videos or have Alexa read your favorite audiobook via the 3.5 mm stereo jack and integrated dual stereo speakers with Dolby Atmos audio. The cameras are very paltry; VGA front-facing camera. 2 MP rear-facing camera. Amazon promises that the new Fire HD 10 tablet is going to provide customers with up to 10 hours of mixed use battery life. It also claims that the tablet is more durable than the 10.5 inch iPad Pro, as measured in tumble tests. Many vendors have exited the tablet space and there are hardly any affordable large screen Android devices on the market. The Fire HD 10 is available on October 11th and is only available in the United States at launch. “Many vendors have exited the tablet space” – This is true. “and there are hardly any affordable large screen Android devices on the market.” – this is not. If the contention is that there are far fewer models than a few years ago, then there is no doubt, but it was overcrowded anyhow, so fewer doesn’t necessarily mean few. One can get higher spec models that can compete with the iPads, but you also pay a similar price.